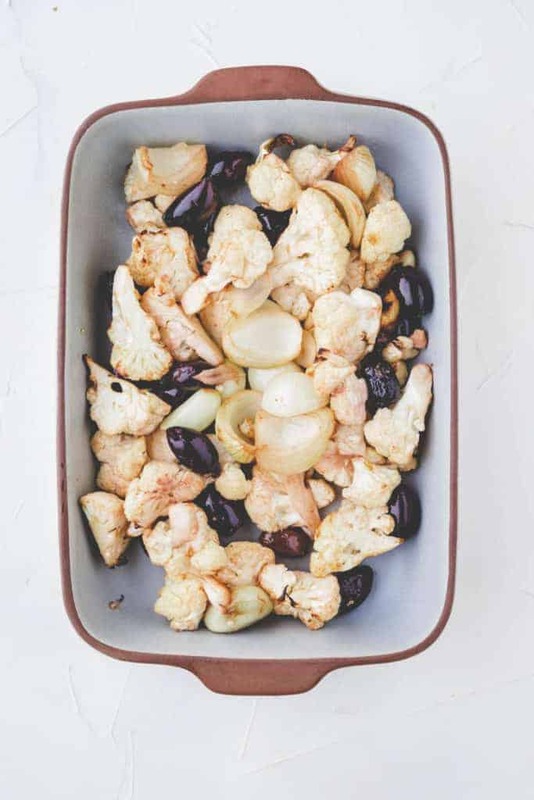 Oven roasted cauliflower with garlic, black olives and onions served with spaghetti – the perfect quick midweek meal with carbs and veggies. This roasted cauliflower pasta is vegan, delicious, and made in 40 minutes. 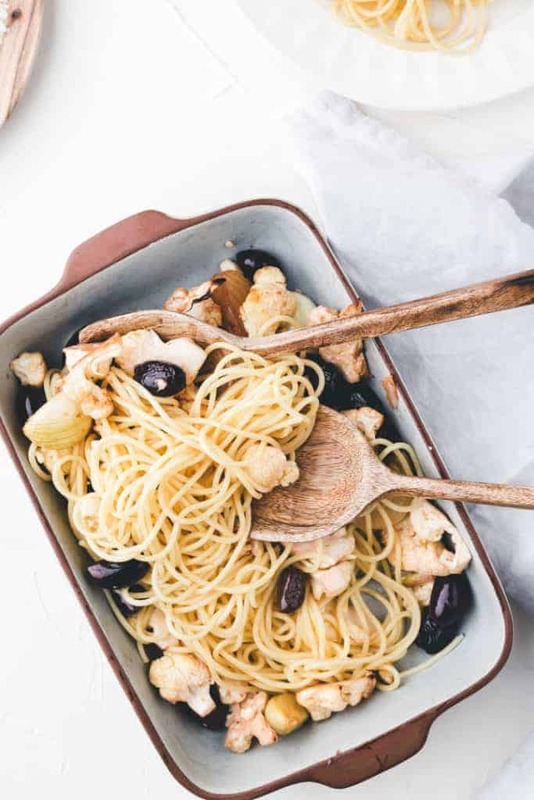 If you are looking for an easy and quick to make midweek meal, this roasted cauliflower pasta recipe is perfect for you! 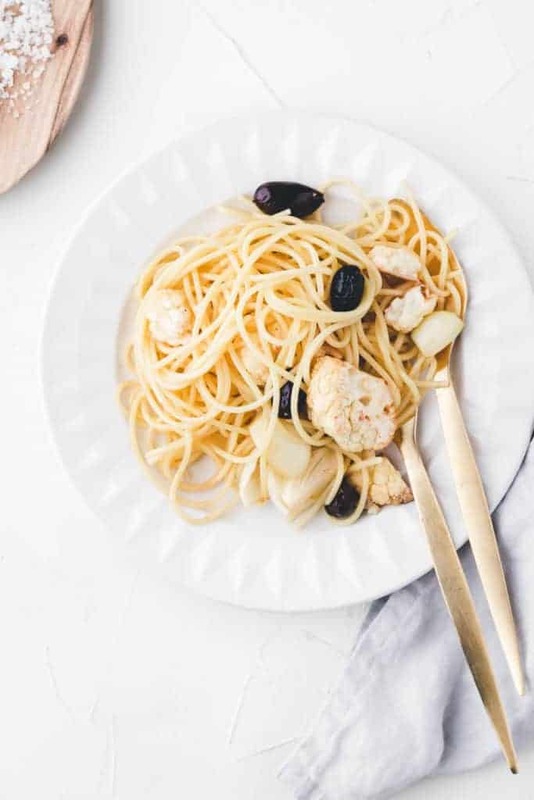 The combination of pasta with roasted cauliflower is delicious, nutritious, and filling. Adding half a head garlic (that’s an insane amount!) to roast with your cauliflower gives your pasta a decent flavor. Don’t worry, once the garlic is cooked, the intense flavor fades away. Use less garlic if you think it’s too much to handle for you! 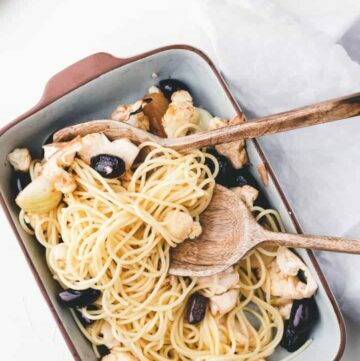 Furthermore, the black olives give this pasta recipe a fulfilling and salty flavor. Make sure to use high-quality black olives like kalamata olives. Often the cheaper ones are green olives which have been artificially colored into black olives. Preheat the oven to 200°C/395°F. 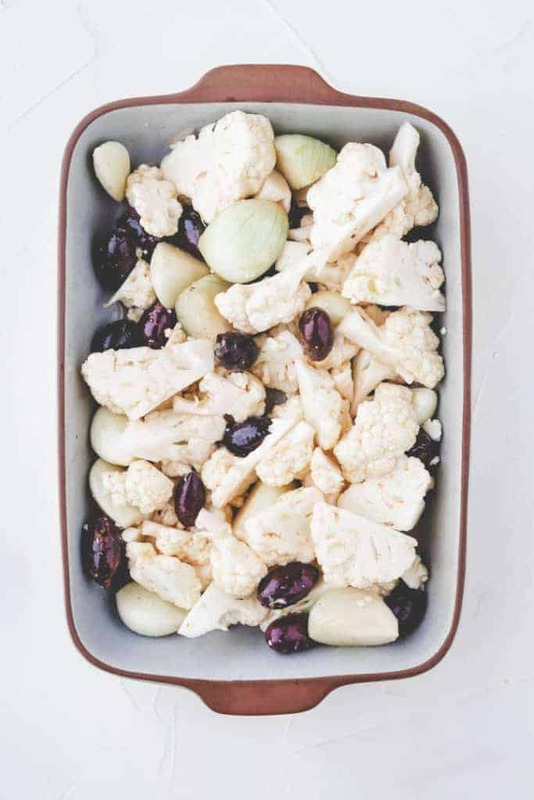 Toss the cauliflower, onion, garlic, and olives with olive oil, red wine vinegar, lemon juice, lemon zest, and sriracha. Spread on a baking sheet and roast for 30 minutes in the oven. Stir occasionally for an even browning. Substitute the black olives with ~1/2 tbsp capers. Use balsamic vinegar instead of red wine vinegar. Substitute the sriracha with sambal oelek, chipotle, or chili flakes. Leave it out if you don’t like a spicy note. Add thyme or rosemary before roasting the cauliflower. 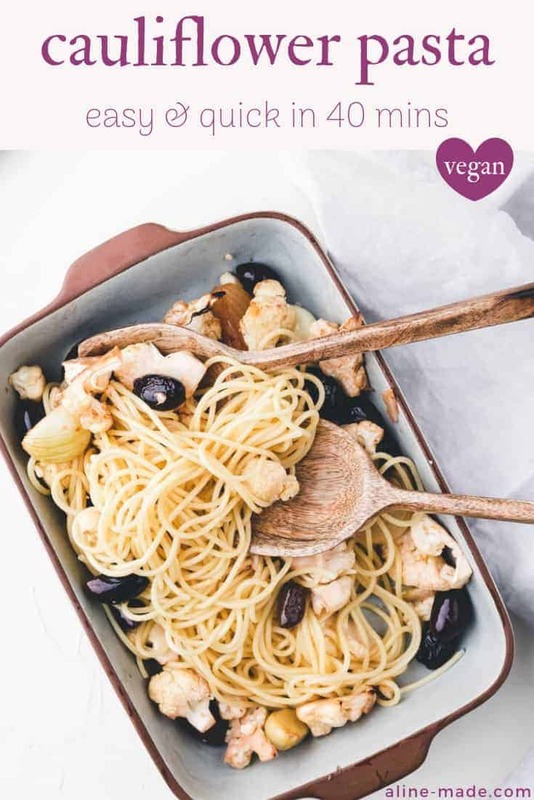 Serve the pasta with vegan cheese or nutritional yeast. Preheat the oven to 200°C/395°F. Toss all ingredients and spread on a baking sheet. Roast for 30 minutes, occasionally stirring, until brown. Meanwhile, cook the spaghetti in boiling salt water al dente. Rinse and toss with the roasted cauliflower. Season with salt and pepper. Add more olive oil and red wine vinegar if desired. If you don’t like olives, substitute them with ~1/2 tbsp capers.